My best-est friend Alison called me up last week and told me she has decided to give the whole Paleo thing a go. This is awesome news not only because I know she is going to love it but also because she is a way better cook than me. So this means she will most likely come up with awesome recipes like this one and then share them with me of course ;) So thanks to my awesome friend I made these, LOVED them and could not wait to share the recipe here with you. So without further adieu and chit chat here ya go! 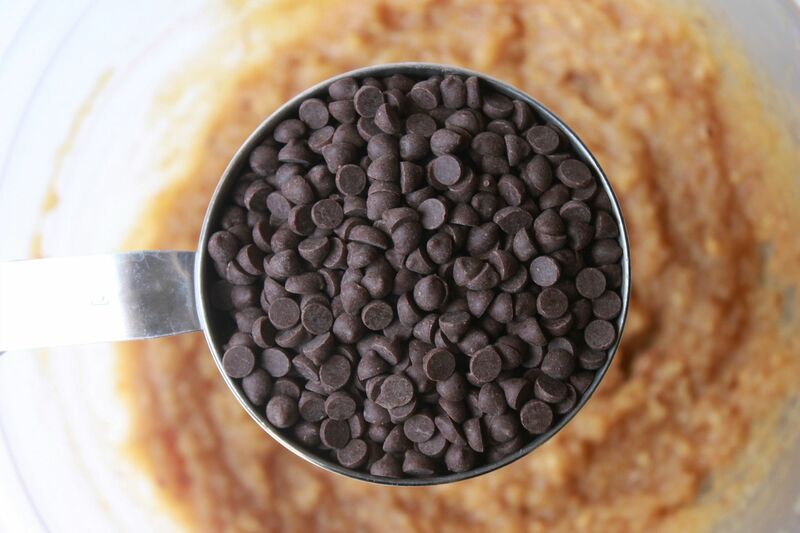 1 cup of Enjoy Life Chocolate Chips (they are gluten, soy and dairy free). *optional- you can add a little shredded coconut on top. Mix all of the wet ingredients then add the dry ingredients. Mix well. Grease a 8x8 baking dish and spread the mixture evenly along the bottom. These are incredible! They are super moist and remind me of a cookie dough brownie. And lets be real a brownie that tastes like cookie dough might just be the greatest thing ever. You can eat these warm or cold and they are delicious either way. If you make these please let me know what you think! Mmmmm...I'm totally pinning these! They sound wonderful! I CANNOT wait to make these! These look so wonderful! Leave it to you to find the best recipes! Thanks for sharing! Yummmm trying to get back on the paleo bandwagon these may just do the trick! Okay.... I'm pretty positive, just by reading the ingredient list that I will be head over heels for these! YUM!!! These look delicious. I'm not completely paleo, but I do have family that is! Although after reading many of your recipes it does seem like a much easier choice than I thought! I will have to try for dessert at our next family meal. Yum!! Those look oh so good! What do you use to grease your baking dishes? Coconut oil? Thiese look amazing! These look soo good! If I ever decide to go paleo I will only be able to do it because of the recipes that you post that actually look and sound delicious!! I just found your blog via Pinterest....So Happy! You have amazing paleo recipes. I am trying your berry cobbler and these blondes tonight. My nanny made these for us this week and OMG they are amazing! Even my husband who doesn't like "healthy" desserts loves it! New follower to your blog. Lots of things I want to try, but did try these blondies. My husband wanted to eat the whole pan. Its a keeper for sure. Delish! ive been reading your blog for a little less than a year-my son was born june 5 of last year, so i love seeing how your little boy ronin is growing. anyhow, i have pcos and have always worked towards a low carb diet, but LOVE to eat and love sweets. since i found your site ive been intrigued by all the almond/coconut flour recipes and finally made this one last week. it was AMAZING. so much better than i expected. 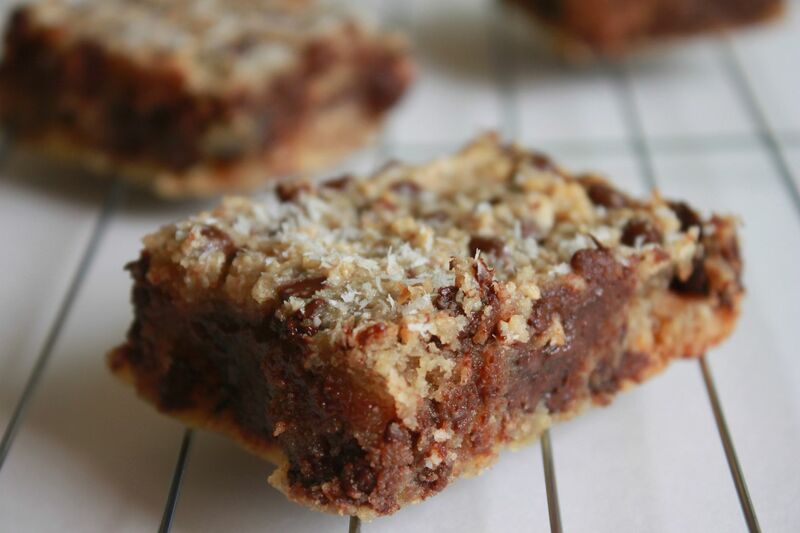 my husband and a set of friends loved them as well-i used to make barefoot contessa blondies and these were just as good if not better. im starting to think about going totally paleo to try and shed a few more baby weight lbs (i already barely eat bread and processed snacks). losing the dairy (greek yogurt and cheese) is really hard for me though! anyway-i read your blog every day (or as often as you post) and have never commented, but just wanted to let you know you have a dedicated reader in the suburbs of NJ! Making these tonight! Thanks so much for the recipe! These were awesome! I'm taking these to the lake house so I can share the paleo love :-) Thank you! Ok I need to try these again. I made them (with peanut butter b/c I am not paleo) and I definitely overcooked them - they were dry... but still tasted good! Actually they don't taste pb-y at all. They taste like a chocolate chip cookie cake (the texture is cakey). Was yours cakey? I am gonna try again, because I did overbake (whoops). And my pb was a little dry b/c it was the end of the jar (double whoops). lol. Just made them today to bring to my mother-in-laws. They were a total success! I just substituted the honey with the same amount of agave syrup. Wonderful texture and taste. Thumbs up. I've made these 5 times already because my husband keeps requesting them! These are amazing and I am so glad you shared! i didnt hear coconut sugar and coconut flour before in my country ..
could you please share these recipes, how can i make at home? Great, great recipe! I tried it last night and was amazed by the taste of the batter, which is usually my gauge of how good the final product will be. ;) I baked them in a deep-dish greased 9x9 pan because that was all I had on hand. But, for some reason, the mixture raised excessively (double or triple what I'm thinking it's supposed to? It was more of a thick cake than a "bar"), filling up almost the entire height of my deep dish pan, which is around three times as deep as a traditional brownie pan. To get the center to bake through and not be so runny, I had to over-bake it lot, which made it very crumbly, the sides were kind of burnt, and the center almost too gooey/tender.. I'll definitely re-do this recipe tonight (even if that batch was kind of ruined, they magically disappeared in just a day! Hehe...) and I'll try to either make two batches in two separate pans or I'll just try to find a bigger pan. Either way, thank you for sharing this gem! :) This is one of my new favorite GF recipes, and I've been trying lots lately! It's just the right level of sweetness, chocolatey-ness and moistness. 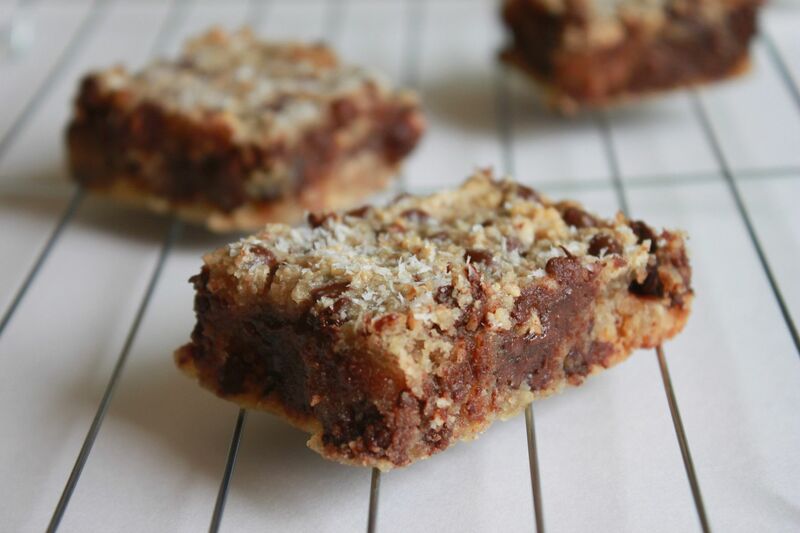 I usually don't really like the texture that almond meal gives my baked goods, but it works flawlessly in this bar! I have made these twice now and mine turn out like cake as well - following the recipe to the tee...still delicious! I have to bake it about 10 minutes longer than it says as well...not sure where I could be messing up but hey- as long as it tastes good! Can I use coconut flour? I used almond meal from Trader Joe's and these came out a little gritty/chewy, but still DELICIOUS. Thanks for the use for almond butter! I can't abide it by itself, but baked in goodies it's amazing! I made these once before and overcooked them, they were good but not great. This time I made sure not to do that. I used peanut butter (not paleo) and added a little cinnamon, and used some ground pecans and walnuts in place of some almond flour. This made them a little crumbly but delicious nonetheless. My brother and husband love them, and my brother said "greaaat dessert sis" - winner! I have a question about the chocolate chips...I know they are gluten free but they still contain sugar. Is that just something you add sometimes or are they considered paleo? So weird, I tried these with almond butter finally... my batter got really thick and they cooked very cakey, this often happens to me with almond butter baked goods. When made with peanut butter, the texture looked more like yours. But with the almond butter the top rose a lot, and it's not bar or cookie-like. And the almond butter is very strong tasting. So weird. I don't know what it is. I have made almond butter cookies before and they turned out great. But these were the same texture as the almond butter muffins I made recently. Hmm wish I could figure out what makes the difference. However, I tasted a section off the edge and it was delicious. Sad to waste such expensive ingredients on this, though. Any ideas what might have caused this outcome? I did not deter from the directions at all and I'm a relatively experienced baker. Maybe turning down the temp and baking longer? Curious if anyone else had this issue! Am looking forward to trying again. 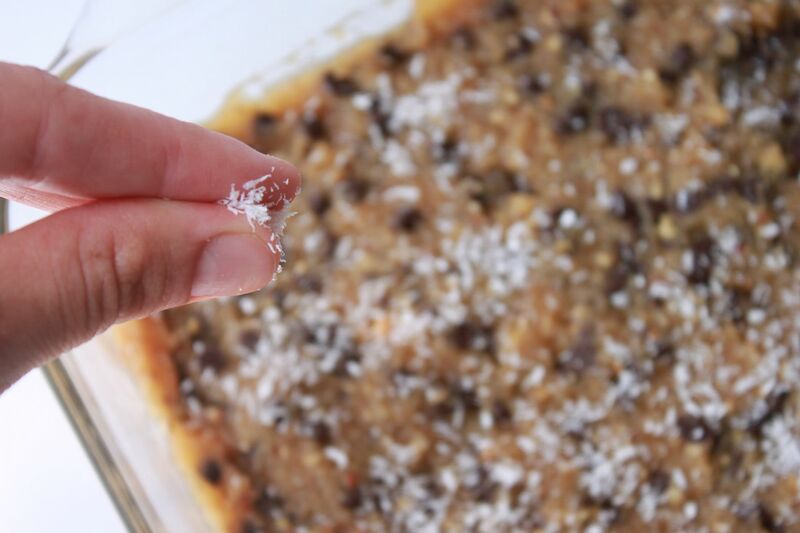 I try to make a paleo dessert each weekend and by far, this is the best!!! Thank you. These are amazing!!! So delicious and set to make!! Thanks! I took these to Girl's Night and everyone liked them. I used homemade cashew butter (soaked the cashews for 24 hours and blended til smooth) instead of almond butter. I really like the mild taste from cashews. I baked the bars in an 8 X 11 pan for 23 min. Would probably cut back to 22 min next time, but they were still moist and chewy. Just sweet enough with the chocolate chips. I added a light dusting of coconut- will add more next time. Reminded me of 7 layer magic bars, but SO much healthier. To Anonymous: I baked them in a slightly larger pan -8 X 11. If you only have a 9 X 13, try leaving the last 2 inches of the pan empty and putting a piece of foil right next to the end of the dough and another piece of foil wadded up to fill the space. I baked for 22-23 min and they turned out really nice. Also, if the edges get done and the middle is undercooked, I have cut the edges off and removed them to a rack to cool. Then I cut the remaining dough in half and flip the middle part (raw-undercooked part) to the outside of the pan, which puts the more cooked part in the middle of the pan. They don't turn out as pretty, but it prevents wasting ingredients and insures more evenly cooked bars in the end.